The Young and the Restless Spoilers: Jack is Victor’s Brother – Genoa City’s Greatest DNA Reveal Ever? 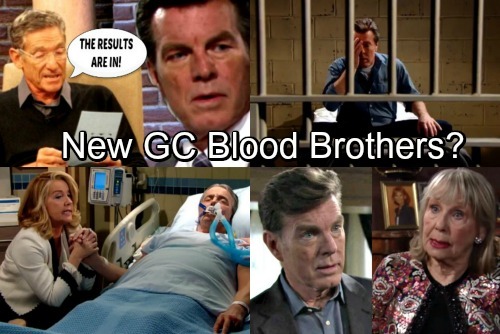 The Young and the Restless (Y&R) spoilers ask why have Jack (Peter Bergman) and Victor (Eric Braeden) been at each other’s throats for so long on? Could it be that their rivalry wasn’t just about personality type, but was directly tied to biology? In what would be the greatest DNA reveal ever, Jack could be revealed as sharing the same father with Victor. Dina’s (Marla Adams) recent admission plausibly opens the possibility that Albert Miller (who was played by the late George Kennedy) was actually the man who sired Jack. That would make him Victor’s blood brother! Y&R fans can only imagine that the soapy Richter scale would be broken if said conjecture proves true. Billy (Jason Thompson) would also forever look like the infinitely better brother alternative to Jack if said rumor is soon confirmed. Longtime fans can rightfully argue that a past storyline, where Jill (Jess Walton) came to believe that Katherine (Jeanne Cooper) was her mother, may always at least equal the greatest Genoa City DNA reveal ever. Subsequent information proved that yes, Jill wasn’t Liz’ (Julianna McCarthy) daughter, but Katherine wasn’t either. The great arc referenced within the last paragraph underscores the potential for Jack and Victor to eventually form a different type of relationship than they were ever capable of having in the past. Clearly, both men would recoil at the fact that they share the same father. But science, along with reason would eventually be unavoidable. Following this speculative line of logic, it is interesting that Abby’s (Melissa Ordway) efforts to document Dina’s memories unexpectedly opened questions about Jack’s paternity. Considering the rapid pace with which Abby and Ashley (Eileen Davidson) pursued DNA verification and Victor’s current shaken state (though he’s come out of his coma), the potential for these foes to be bro’s is tantalizing. Abby, who is Ashley and Victor’s daughter, but not actually Dina’s granddaughter through John, pushes out the fact that Jack is her uncle, but not through her mother. Jack would be Abby’s uncle through Victor, his brother. All devoted soap fans were able to follow what was just presented and now must ponder the amazing potential of this proposed, epic storyline. Yes, it could become the greatest turnabout ever! Come back to CDL for all your spoilers, news and everything linked to The Young and the Restless.